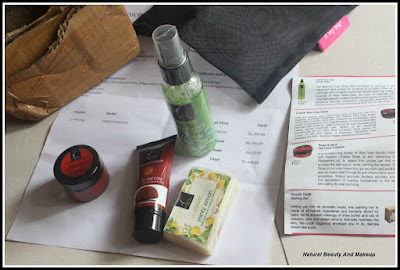 Today, I am going to show you my new subscription bag ‘O MY BAG’ from Natural Bath & Body brand. 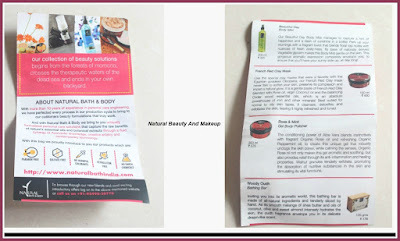 Well, this is my second subscription bag after The Nature’s Co Beauty Wish Box, but first from Natural Bath & Body. I am yet to try other subscription boxes as well :D.
So let’s hop into the details right away, but hey at first let me tell you a little bit about the brand. Price: INR 399. With additional flat shipping rate 50/, I paid Rs. 449. O MY BAG brings you the freedom to experience and experiment with their wide range of products so that you can find your best fit. To get access to their lovingly created selection of trial packs every month, all you need to do is to subscribe this bag. The site is user friendly and each product category has 4-6 variants to choose from their different skincare ranges, according to your skin/mood type. I received this bag a few days ago. The products came to me in a neatly packed cardboard packaging. Inside, the products were housed in a black small pouch along with the invoice and a pamphlet featuring all the product details. 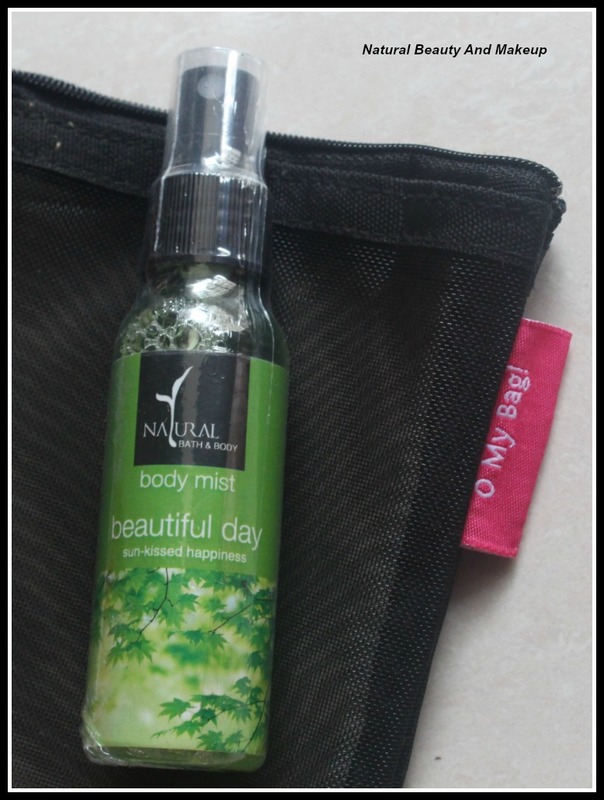 Beautiful Day, Body mist: Infused with organic vegetable glycerin and aloe vera extract, this body mist is gentle on the skin. This gorgeous aromatic expression completely envelops you, to ensure that you’ll have your sunny side up, all day long. By the way, this is my first ever body mist and I am really excited to try out it throughout this month. 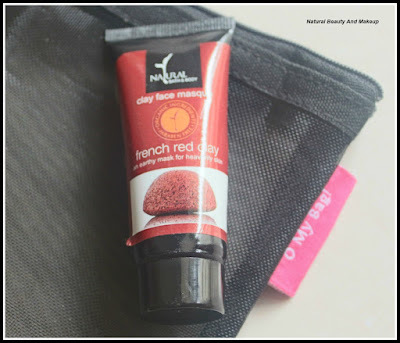 French Red Clay Mask: It is a gentle paste of French Red Clay blended with Rose oil, virgin Coconut oil, and the balancing Cedar wood essential oils, which is an absolute powerhouse of iron and other minerals! Best suited for normal to oily skin types, it cleanses, detoxifies and exfoliates the skin, leaving it highly refreshed and toned. What more could I have asked for, truly happy to receive this product in my O My Bag! Rose & Mint, Gel Body Polisher: The conditioning power of Aloe Vera blends instinctively with fragrant Organic Rose Oil and refreshing Organic Peppermint Oil, to create this unique gel that robustly unclogs the skin pores, while calming the senses. Walnut granules tenderly exfoliate, promoting the absorption of nutritive substances in the skin and stimulating its viral functions. I am ready to pamper my skin with this body scrub, hope it would work great for me. 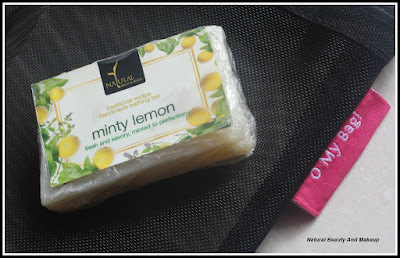 Minty Lemon, Bathing Bar: Now, here comes a twist. 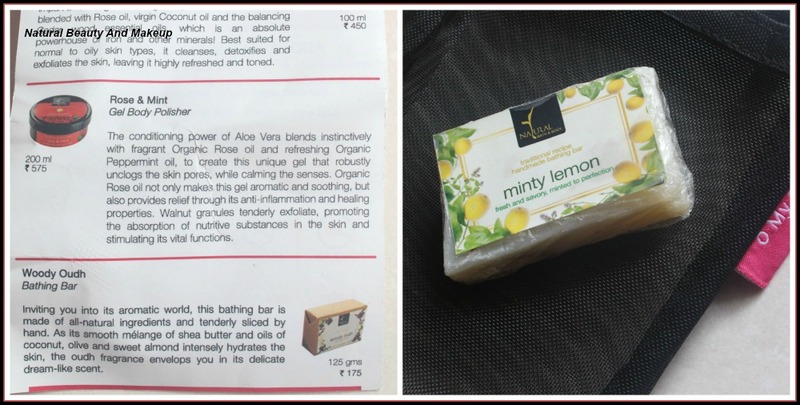 In their card, they mentioned about another variant Woody Oudh, but I received Minty Lemon bathing bar! It is made of all- natural ingredients and sliced by hand. So, these are the new products which I have yet to try and after thoroughly using them I will publish my views over here. All these products came into a black coloured small net designed see-through bag with a zipper. On one side of this bag, there is a tag of O My Bag. It looks cute, isn't it? My overall shopping experience is good with them, only one thing I disliked which I think I should mention here. This brand gives you an offer of 20% discount when you shop for the first time from their site. I placed my order for the first time on this site, so as usual, I got that discount code too in my inbox, but when I tried to use that code, it wasn’t working! I communicated with them via email, but no reply from their end, hence no discount I could avail. Otherwise, I received my bag within a week; in between, there was a public holiday, though. 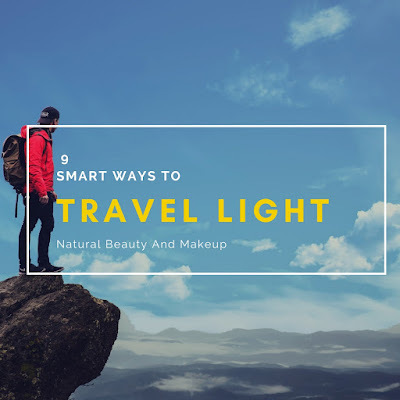 Since I am into skincare more than makeup, I do have high expectation from these skincare products. I hope, they won't disappoint me. 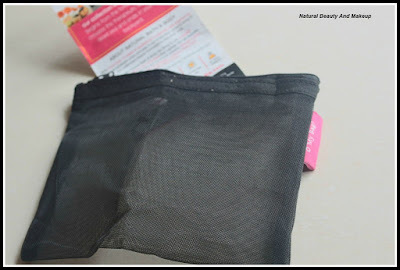 Moreover, it is one of the most affordable subscription bag available in India, so everyone must give this bag a try. One more thing, which I have noticed today while visiting their page is, no bathing bar is available now, instead, you can opt for soothing potions like bath oils, bath milk and body latte! Great. 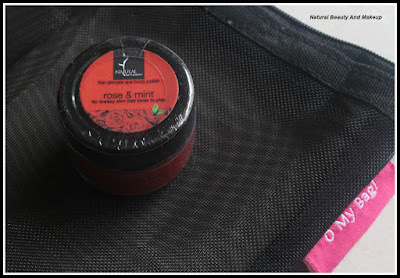 Hope, you have liked my O MY BAG skincare products and this post. Have You Ever Experienced O MY BAG Subscription Bag From Natural Bath & Body? Share Your Experience With Me In The Comment Section Below. What a nice post ! I'm glad that they are doing subscription boxes in India too ... helping small or large businesses . I haven't tried any of the products ... But French mud clay mask do attract me . I might aswell order it online. Thank you for sharing ... And I'm working on my daily hair ritual post . Wonderful products you have received. Rose n mint body polisher and minty lemon bathing bar seem nice..
Minty Lemon bath bar sounds so uplifting babes and pls do a detailed review on the clay mask.. You know my love for skincare products ahh this post is just wat I needed!! 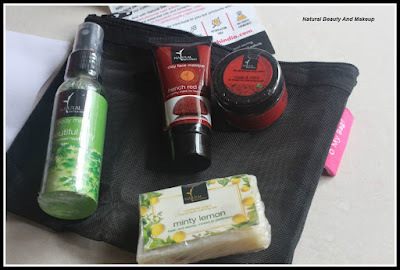 A bag of natural bath & body products. I've got to try this. Really love their range. Nice products, I like that lemon bathing bar. Good your enjoying trying new products and telling others about them in your blog. Keep it up!! You have a nice selection of products here! Thanks for sharing a great review! I write Mademoiselle Meets Maquillage and Macaroons and I would love for you to give it a read and follow me on social media if you like. Does this Box contains hygiene products ? Products like toilet seat sanitizer or intimate washes ?